Combining microdermabrasion and facial ultrasound makes more effective skin rejuvenation. 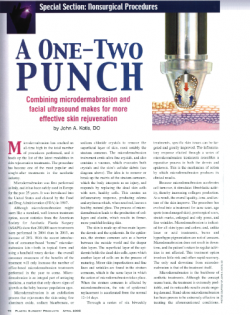 Microdermabrasion has reached an all-time high in the total number of procedures performed, and it heads up the list of the latest modalities in skin-rejuvenation treatments. The procedure has become one of the most popular and sought-after treatments in the aesthetic industry.